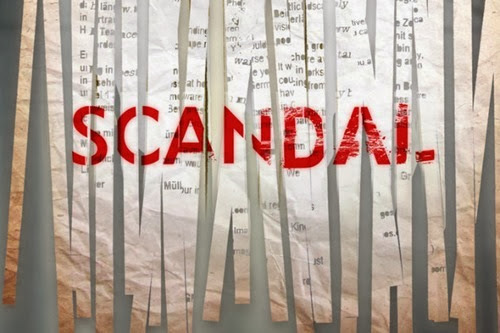 A beautiful thing happened during the Scandal Finale – I actually liked it! I actually felt happy when it ended! The writers finally let the two main characters be happy! I had spent the day preparing myself to be sorely disappointed and had been talking about saying goodbye to Olivia and Fitz as well as to the show, but the most shocking thing happened that could have – I actually want to come back in the fall! However, I still reserve the right to quit after the premiere if everything has reset itself and the end of this finale episode has been disregarded – in that case I will not be happy anymore! The story line of this episode was that Olivia and her team were working to take down Command (again) and Mellie was waiting for her election results for Senator of Virginia. The episode started with Command himself (Olivia’s father) meeting with Mellie and pretending to want to finance her campaign. In order for him to do that though, he needed a favor, and to get that favor, he shared his knowledge of Mellie’s affair with Andrew, Fitz’s relationship with Olivia, and the President’s involvement with Operation Remington (when he was ordered to shoot down a passenger plane – this was later covered up by his father). Mellie agreed to provide Rowan with the list of names he wanted in order to keep him from sharing the information he held over her. The names ended up being the jurors who were at that moment hearing testimony from Jake regarding Operation Remington and B613 – and these jurors were all brutally murdered. (Later we find out that it was Huck who murdered them, because he was threatened by Command, and we last see him and Quinn as she holds a gun to his head). Mellie made a mistake in that she did not go to Fitz and tell him what had happened. While spouting things about them being a team, she obviously felt much more team-like with herself, and she therefore went to Cyrus and told him what happened instead of talking to Fitz. And Cyrus, who has always felt that he needs to protect himself by protecting Fitz, does whatever he needs to do to stop the investigation from moving forwards, including meeting directly with Rowan himself. Meanwhile, Olivia also doesn’t tell Fitz about the Remington testimony, though she does call him after she starts to feel guilty for possibly getting him into trouble by using what he did to help bring down her father. Fitz is on the way to sign the Brandon Bill into law and Olivia tells him how proud she is of him for passing this law. Fitz points out that it was her who got Brandon’s father to the Oval Office in the first place, which led to this bill, and he also calls his vice-president a Muppet, which made me laugh. Then Olivia says goodbye and hangs up. After Olivia finds out about the jurors being murdered, she is so angry at her father for once again having the upper hand, and she goes to her mother to try to find out more information about her father. Her mother informs her that no one even knows who Rowan is, so Olivia heads over to the CIA to present them with the information. The CIA director apparently already knew about B613, but it is much bigger and scarier than she had thought. With threats from Cyrus though, Olivia and Jake end up jailed with David showing up to make them recant everything – after he too is threatened by Cyrus. In order to finish everything off, Rowan has all agents and information remaining about B613 destroyed and calls Olivia to gloat, telling her that Rowan is gone and only Eli Pope remains. Olivia realizes that even though they “can’t take command,” they can take Eli Pope, and she and her team have him framed for embezzlement. At the same time, Mellie is elected Senator and gives a victory speech. Lizzie tells Fitz everything that happened including showing him a picture of the man who did this, who he of course knows to be Olivia’s father. Fitz realizes that Mellie and Cyrus went behind his back and did whatever they could for their own causes, and he therefore tells Mellie to get out of his house and he fires Cyrus. Lizzie ends up getting Cyrus’s job, which was apparently the reason she told Fitz everything in the first place. Jake and Olivia arrive back to Olivia’s house and Olivia is ready to drink wine with him, but Jake tells him he’s finished. His mission, from both her father and the President, was to protect her and keep her safe. Even though he actually did not do that when she was kidnapped out from under his nose, he feels that his mission is now complete. He reiterates that he’s in love with her, but explains that he knows Olivia is in love with someone else – Fitz. He tells her that she deserves what belongs to her and that she should go and get it. Fitz comes to Olivia’s apartment and no one is there. He truly believes that she once again left him and he walks through the White House completely alone. However, once he steps out onto the Truman balcony and lets out a sad sigh, he is surprised that Olivia is actually THERE. She came to him, she chose him, she’s ready to find love with him. Fitz is completely shocked to see her and looks as if he thinks he’s dreaming, but she reassures him that she is in fact there. Here Comes The Sun begins to play – Jake is not the sun for Olivia afterall – it’s always been Fitz. And it’s beautiful. And that is how you end a season! If in the end, Olivia and Fitz are meant to be together, this certainly could have been the series finale. However, it was not – there is another season ahead. I long to see this relationship continue to be built and grown because there is so much that can be explored with Olivia and Fitz actually together, but unfortunately, the show creator thinks that having them together permanently would be the end of the show. Maybe she’ll spend her time off reconsidering that?? There’s always hope.